— which has made him the exalted teacher of gods and people. Then, after characterizing the possible meanings of Abhidharma in the context of their presence in canonical statements expressing Dharma, I draw conclusions about the connection or lack of connection between philosophy and soteriology in the teaching of the Buddha. Finally, after recalling the canonical statements of Buddha on his status, I conclude that the characterization of early Buddhism as a religion is also questionable. Did the Buddha practice asceticism prior to his awakening? A critical analysis of the Māhasīhanāda Sutta from the Majjhima Nikāya: It is widely believed, that the Buddha practiced the most radical forms of asceticism and self‑mortification prior to his awakening. A critical analysis of the suttas depicting that crucial period of his life shows, however, that the only text which portrays the bodhisatta as a foremost ascetic is the Māhasīhanāda Sutta (MN 12/I, 68). The aim of this paper is to examine the issue of the authenticity of this text and thus to answer the question as to whether there is enough ground to claim that the Buddha was an ascetic at all. Through a comparative analysis, I show that the structure and content of the Māhasīhanāda Sutta cannot be reconciled with other suttas from the Majjhima Nikāya, which describe the bodhisatta’s path to awakening. I point out certain late features of the Māhasīhanāda Sutta. Then, through a comparative analysis I try to show that some parts of the Buddhist text may have been borrowed from the Jain yāraṃga Sutta. Next, I attempt to reinterpret the term attakilamathānuyogo from the Dhammacakkappavattana Sutta in such a way which will not pertain to asceticism. In the final part of the paper, I try to explain how the view that the Buddha was a foremost ascetic prior to his awakening could have arisen. Krishna’s skirmishes with the Buddha. 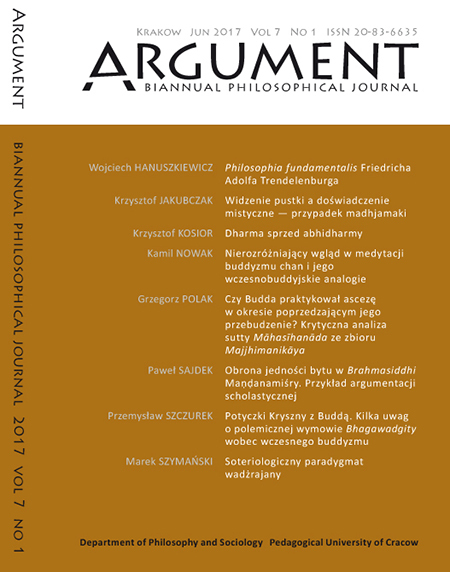 Remarks on the polemical meaning of the Bhagavadgītā towards early Buddhism: The paper discusses the issue of the confrontation of the Bhagavadgītā with some aspects of the early Buddhist doctrine as presented in the Pāli canon. The confrontation points to the Bhagavadgītā as being a poem of the (broadly understood) orthodox current of Indian religious thought, which also contains some polemical elements, these mostly addressed to the most powerful heterodox religious current in the first centuries B.C. (which is most probable the date of the Bhagavadgītā’s composition). Several parts of the famous Sanskrit poem are compared and confronted with the respective parts of the Pāli canon in order to demonstrate, firstly, the different approaches of both currents, mostly in ethics and metaphysics, and secondly, the Bhagavadgītā’s reaction to particular elements of early Buddhism. The first six chapters of the Sanskrit poem have been subjected to analysis in this respect. Seeing of emptiness and mystical experience — the case of Madhyamaka: The problem of Buddhist religiosity is one of the most classic problems of Buddhist studies. 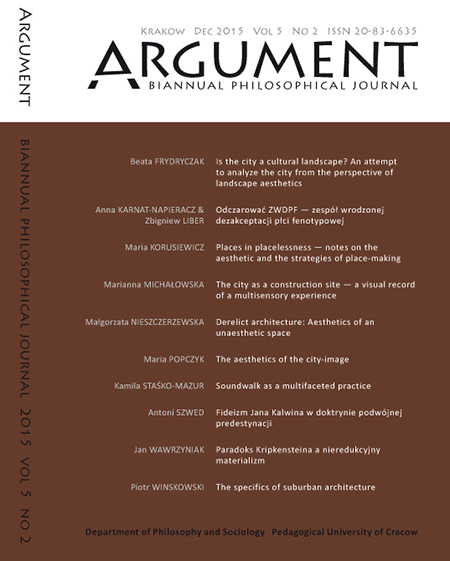 A particular version of this issue is the search for mystical experience in Buddhism. This is due to the conviction that mystical experience is the essence of religious experience itself. The discovery of such an alleged experience fuels comparative speculations between Buddhism and the philosophical and religious traditions of the Mediterranean area. Madhyamaka is the Buddhist tradition which many researchers saw as the fulfillment of such mystical aspirations in Buddhism. 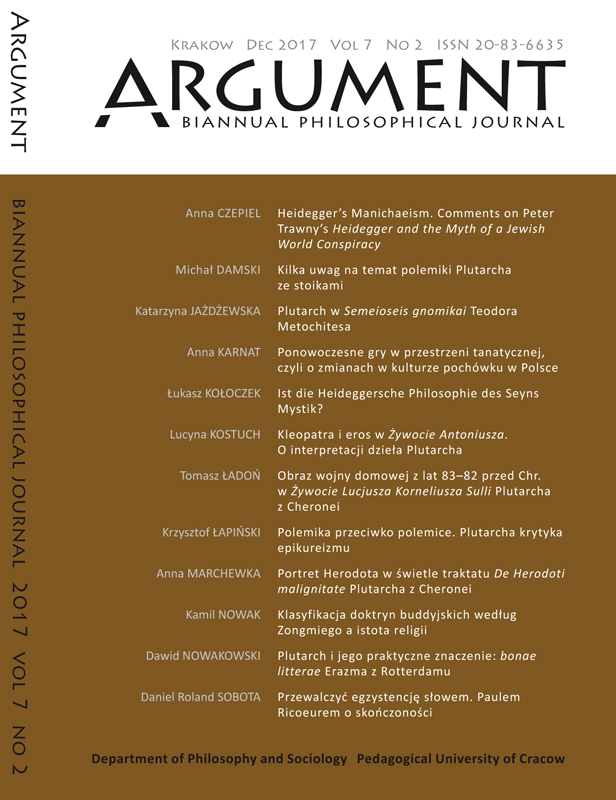 In this paper I specify the standard parameters of mystical experience (non‑conceptuality, ineffability, paradoxicality, silence, oneness, fullness) and I conclude that they either cannot be applied to Madhyamaka or that the application is only illusory. In the paper a comparative analysis of Chan Buddhist meditation and the early Buddhist meditation has been conducted. In the first part the meditational instructions present in Zuochan yi and the corresponding texts of Chinese Buddhism have been demonstrated. Subsequently, based on those texts, the ideal type of Chan Buddhist meditation is created. The second part consists of the analysis of Aṭṭhaka‑vagga with the corresponding motifs from the other Pali Canon Suttas. The last part consists of a comparative analysis of the ideal type of Chan Buddhist meditation and meditation as shown in Aṭṭhaka‑vagga. The whole of the analysis aims at demonstrating the topos common for the early Buddhist tradition and Chan Buddhism. that are not dependent on enlightened beings’ good will. However, such a position need not exclude the appreciation of moral and cognitive virtues. Some aspects and variants of the Vajrayāna soteriological paradigm are discussed to avoid any misinterpretation. 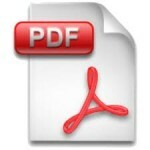 A defense of the unity of being in the Brahmasiddhi of Manḍanamiśra. An example of scholastic argumentation: Chāndogyopaniṣad 6 comprises as many as two out of six renowned “great sayings” (mahā‑vākya): tat tvam asi and ekam evādvitīyam. The question arises as to whether the declared in śruti unity of the Absolute Being is to be understood literally or figuratively. The opponent (pūrva‑pakṣa) presents three arguments for the figurative meaning of the words. Maṇḍana advocates the literal sense of the statement. 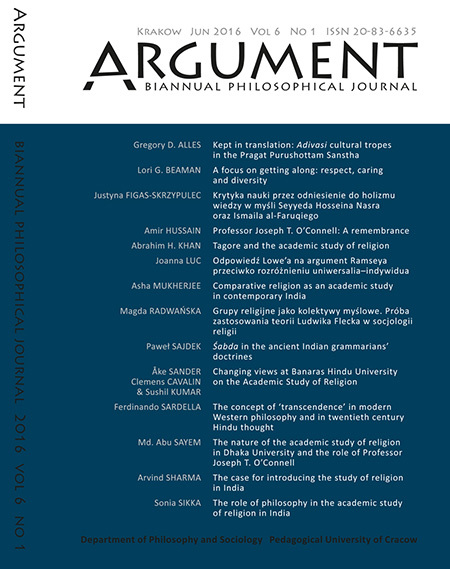 The debate is a typical example of an Indian philosophical scholastic text. Scholasticism in India and scholasticism in medieval Europe share some characteristic features, though they also differ in many ways. and was influenced by Georg Wilhelm Friedrich Hegel and Friedrich Wilhelm Joseph von Schelling. On the other hand, Trendelenburg has educated a very large group of important figures within the German philosophy of the late nineteenth and early twentieth century (e.g., Wilhelm Dilthey, Franz Brentano and Hermann Cohen). His main work, Logische Untersuchungen (Logical investigations), was to see its release in three editions during his life. In the second edition Trendelenburg adds an introductory chapter, entitled Logik und Metaphysik als grundlegende Wissenschaft [Logic and metaphysics as a basic science]. 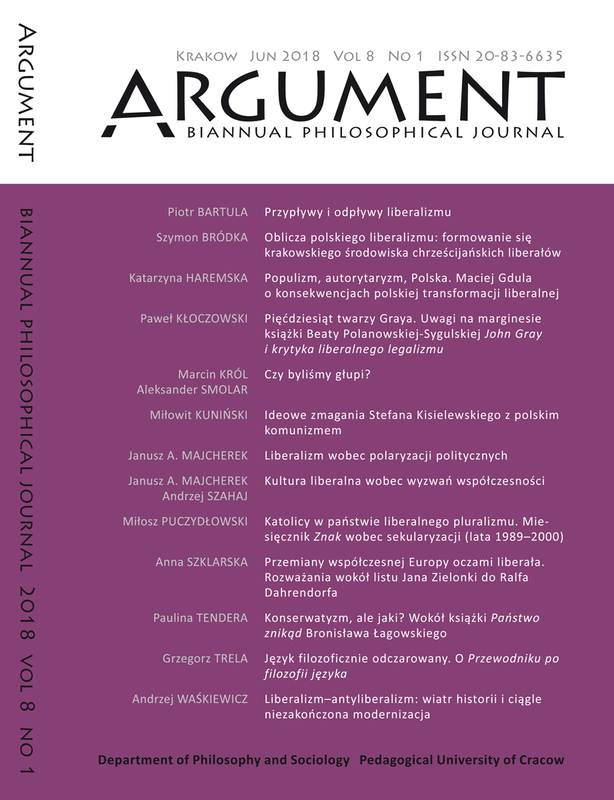 It presents the idea of philosophy as a science and, like a lens, focuses on the most influential metaphilosophical solutions of the second half of the nineteenth century. 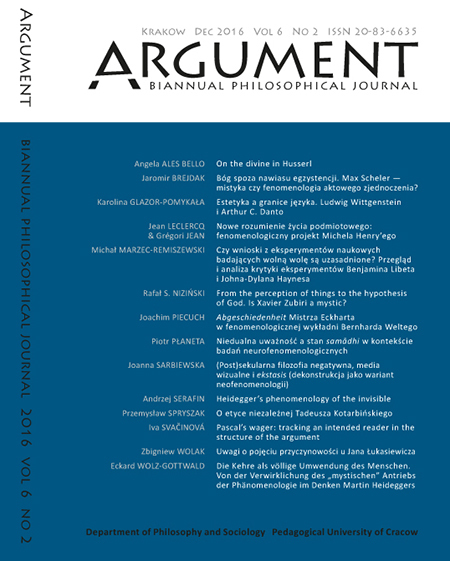 The article in its first part presents the academic biography of Trendelenburg, while in the second it discusses the most important meta‑philosophical problems raised in Logische Untersuchungen. Źródło przekładu: Kawamura Kōdō (Red. i przyp.). Dōgen zenji zenshū, dai 2 kan. Tōkyō: Shunjūsha. s. 4–14). W: F. A. Trendelenburg. Logische Untersuchungen. Leipzig: Hirzel.